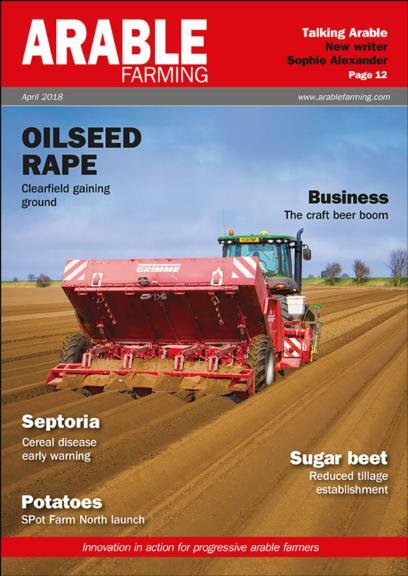 Don’t miss this month’s new look Arable Farming. Take a look at the digital edition today. Spring put in a fleeting appearance the weekend before Easter. Here in my corner of Suffolk you could almost hear a simultaneous flinging open of shed doors and yard gates as an army of cultivators, drills, spreaders and sprayers made a dash for the fields. We had a couple of days of intense activity before rain set in, temperatures plummeted and everyone headed home to continue fretting about the ever-narrowing spring workload window. As I write on March 29, one year from today the UK will exit the European Union. A 21-month Brexit transition deal secured in mid-March was widely seen as a valuable breakthrough for UK business – if not bringing certainty at least alleviating any immediate need for guesswork. And as Arable Farming’s policy wonk Abi Kay points out in this issue’s Policy Watch (p14), the Government’s consultation on future farming policy commits to an agricultural transition lasting several years beyond the implementation period ending on December 31, 2020. However, one topic which is likely to see attention from Westminster sooner rather than later is soil; it is believed the Government’s Agriculture Bill will contain, for the first time, mandatory soil health measures and targets. Defra Secretary Michael Gove is a keen advocate of min- and no-till and it was interesting to see the debate on social media recently, where concerns were expressed that many farmers would be put at a commercial disadvantage because their soils are not suitable for these approaches. The reduced tillage advocates among you may disagree, but what I think we all can agree on is that soils don’t become min-till-ready overnight. Mention of min-till provides, conveniently, an opportunity to introduce our new columnist Sophie Alexander. Sophie farms 410 hectares at Witchampton in Dorset, growing a range of arable crops plus grass leys. She is a member of the Innovative Farmers network and what I think is of particular interest in the current climate is that she farms organically. I will leave you to read her excellent first column (p12-13) to discover the link with min-till, but suffice to say I’m looking forward to hearing more from Sophie in the coming months. Two heads are better than one as the saying goes and I hope, in our own small way, we can bring together best practice and ideas from the conventional and organic sectors for the benefit of all our readers.